About a week ago, my Facebook account started getting Wall updates sent via email with text like, Im giivng away my old Iphone 3gs just got Iphone4 =) (misspelling by Facebook spammer, not me) and a link to a Facebook app. I couldn't find anything on my computers that could be causing this and my Android phone isn't currently connected to my Facebook account, so I couldn't figure out what might be causing the problem. After some research I tracked down the solution. From what I can tell, the spammers managed to figure out a bunch of the Facebook mobile email addresses people can use to send photos and status updates to Facebook. Each email address is unique per account, so knowing my Facebook mobile email address would allow anyone to send an email to my Facebook account. That seems like a flawed system already, but fortunately there's an easy fix. To stop these annoying spam messages, you need to first be signed in to Facebook. From their go to http://www.facebook.com/mobile. Once you get to the mobile page, you are going to change your upload email. You should see something similar to the screen below. To change your upload email, click that green button that says Send me my upload email. If you don't see that button, here's why: Facebook changes the layout of this page almost every time you visit it, so you might have to look further down the page to find your Sometimes the screen looks a little different and the email will appear in a smaller section further down the screen. If you don't see that green button, look for a link that says Find out more instead. In either case you will get a lightbox window like the one pictured below. 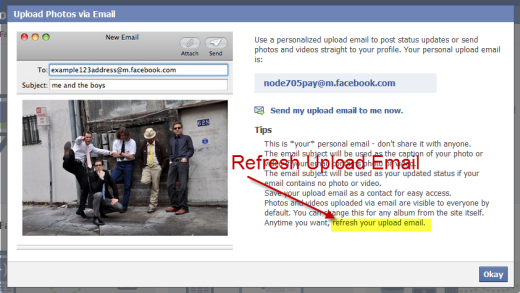 You will want to click the link that says refresh your upload email. This takes you to another window where you click the Reset button to generate a new upload email address. At this point, your email will be reset and your account should stop receiving new spam wall postings.